In the Autumn I spent a couple of afternoons with Cambridge Community Circus. They are a really friendly group of all ages who come together to practice rope, trapeze, juggling and ribbon skills. They are focused and the work is very intense, so of course the poses you see in my book are only held for a few seconds. It is a real challenge to draw, to translate the energy, focus, tension, balance and poise in the ‘acrobatics.’ I really had to look, look, look and just let my hand draw. I would sketch a leg and back from one pose and an arm and chest from another. Please click on the link to see the full sketchbook on Youtube! I am looking forward to working on this theme more in the near future. I have always sketched people, at home and on my travels. This winter, with little travel planned, I naturally gravitated towards my local train station. This gave me people going about their business, too busy to notice me, too concearned about catching their train. I position myself, often perched or leaning, and my ‘models’ enter my line of vision, they enter my drawing and they then have the choice to move on if they do not wish to be included. 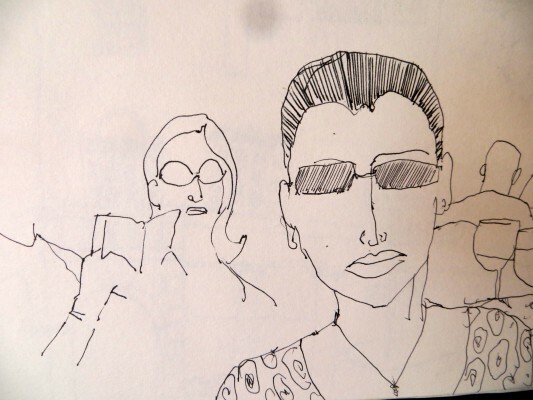 I love it when someone sits opposite me and stays quite happily – rarely do they ask to see the drawing as they often move on to catch their train. More often that not my models are so focused on their phone, game, music they pay very little attention to anyone else. Am I the only one still interested in people watching and listening to snippets of conversation? 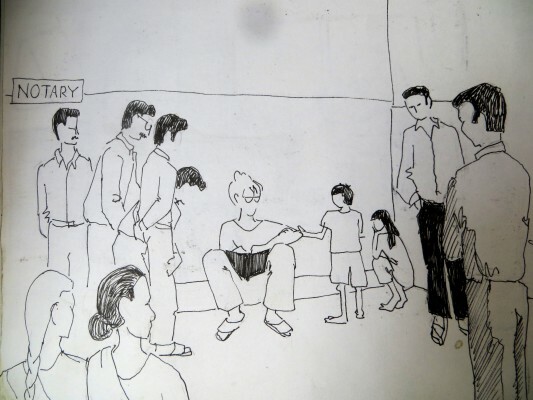 The drawings above include a ticket collector – before permission was needed (BR informed me last month that I could draw on the platform but not their staff) french cafe ladies and my first sketching day in India. Slowly a crowd of men and children gathered to watch, the small boy kept his hand on my arm as they all chatted happily giving me advice and hot tea! Wanderarti.com a beautiful new site dedicated to showcasing art and travel, asked me these questions this week. I am looking forward to (hopefully) being featured on their blog soon. Your travel pieces have a very distinct style. How did this develop? My work has the overall sense of a painting but as you look close you will see that it is skilfully built up using layers of found papers, tissues and acrylic paint. When I travel I sketch and collect – paper bags, tickets, lettering, envelopes, shopping lists, posters…often from the street. The more worn and distressed the better. When I stopped travelling so much and made a studio space (ie. a table to work on) I started to use all my ‘paper scraps’ plus hand painted tissue paper and other bought papers to assemble my collages. I love the spontaneity of working this way, I can keep altering and recomposing by gluing more on or peeling some off. Paper collage has many edges, ripped, torn and cut. I see the beauty in paper shapes, accidental marks and worn surfaces. By simplifying and flattening space with these shapes plus photographs I can recompose and avoid representational clarity. The vibrant colours, layers of tissue, positive and negative shapes all give a feeling of unity. I usually draw in a fine liner pen, but lately I have been using charcoal and oil bars. The lines in my sketches are the edges of my collaged papers. What’s the process behind your work? How is each piece realised from idea to physical piece? I begin in a spontaneous way with cut shapes that relate to my subject (archways, doors – Marrakech) These ideas are taken form my sketchbooks and photographs. Many hours are spent deliberating over arrangements of papers, layers, edges, surfaces. As the pieces begin to link in an interesting way a sense of unity and design develops. I will have a scene, a place, a memory in mind but this does not dominate, the collage is the idea, it is liberating and leads me in new directions. There are recognisable parts that draw the viewer in but snippets of lettering, textures and colours allow the viewer to use imagination too. Increasingly there is a strong abstract element but still with recognisable elements. Tell us about your travels. Where did you go, what did you see, best bits, worst bits? I spent most of my twenties and early thirties travelling and working around the world. I started in Greece working as a travel rep, I got the travel bug and carried on – bar work, hostess for sailing holidays, managing a sailing company – this took me to Turkey, the Caribbean, India, Cuba, Australia and New Zealand. I settled for a couple of years in NZ and began to use my collages for book covers and magazine editorial work. Best bits – being foot loose and fancy free! Sitting sketching in little back streets and village squares – being totally absorbed in the scene around me and accepted by the locals. Worst bits of travelling…hard one, can’t think of any! Why did you sketch and make art whilst you travelled? I always have a sketchbook on the go. 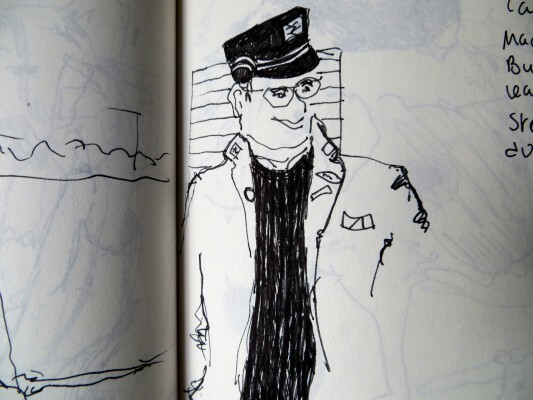 I try to record the characters, scene, buildings, the everyday life around me and often a scene develops as I sketch. Locals have moved rickshaws, brought me hot tea, chased dogs away, and posed carefully as I sit quietly. When I sketch I am totally focused, not just on what I see, the sounds and smells are just as important and are easily recalled when I look at the sketch or final collage. Aside from travel, what inspires your work? People watching, the human form. I am working on a series of people travelling (through the railway station) and a circus/burlesque theme at the moment. What do you hope your pieces tell a viewer about a place? I want the viewer to be reminded of a visit to that city/country, a memory of the smell of a morning coffee in the shady cafe, the feel of sun warmed walls. I want to capture the memory of a place and the sense of human presence, echoing the passing of time. Viewers will recognise bits of lettering, signs, colours that will evoke other travel memories. If you could make art anywhere in the world, where would it be and why? I would love to have a mobile studio, a pop up studio, that I could set up in the back streets of any sunny city (preferably the older, dustier ones such as Bombay, Rio, Havana ) hidden slightly, in a shop or house. It would be equipped with all my papers, glue and scissors, shaded from the sun and rain. I would love to be sent on assignments to document and record the flavour of a country – and be paid! I went up there ( it is on one of the only hills around here) for two days of Open access at the start of the New Year. With only six artists in a huge room full of presses and workspace and with two technician/tutors at hand it is a dream come true. All the equipment is clean and ready. Open access costs £48 per day so plan and prepare carefully – I always try – but then find after at least half a day that it is just not happening. Another cup of tea and a review and slowly the prints start talking back to me, the right techniques, the spontaneous mark making starts to happen. Then I can’t print fast enough, can’t sleep that night – busy planning the next day. Two days later and I have at least 12 monoprints ready to collage and draw into. Got to stay loose. Looking at a Burlesque drawing session in Camden this weekend…. Sooo.. Welcome to my blog. I have been busy finding my way around wordpress and paypal. Lots of images blogged and not many words so far. I have a very tight neck and sore shoulders from sitting at my laptop for three days so I am looking forward for to a big yoga session tomorrow. Next step is to intergrate all this social media. I am on FB and twitter and use mailchimp for newsletters – which is really user friendly. What finally made me sit down and get on with it? I watched Roos’s inspirational ‘no messing – do it now’ clips and got on with it. A big thanks to all those artists who spend their precious time sharing their marketing knowledge to help others. A happy creative, inspiring, focused, positive, productive New Year! Welcome to my first blog ! After a day of research into social media and marketing here we are, big thanks to Roos Schuring.